Better And Better: Training. A good day. 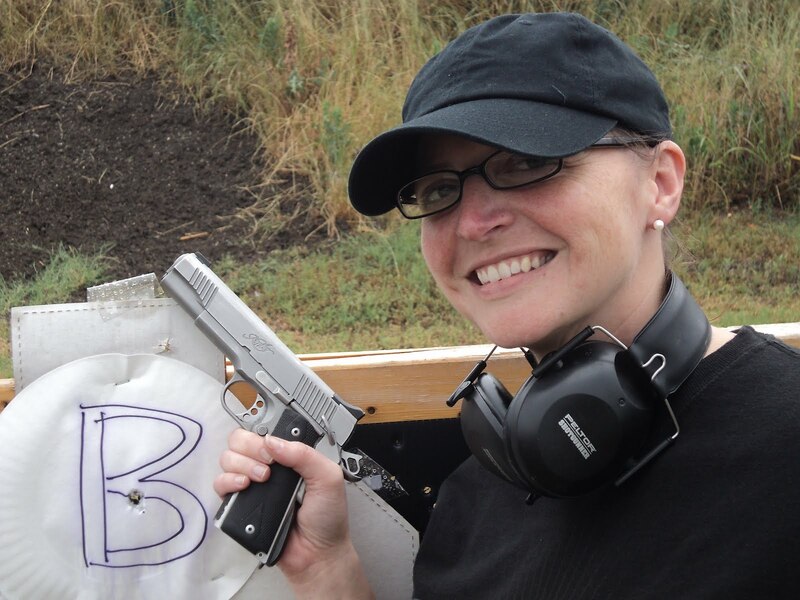 My friend's wife Dawn wanted some firearms instruction. I mentioned here what I planned to do, before even notifying my father, who was integral to the whole thing. I watched Dawn and my boy fall in love, and stood at their wedding 14 years ago. I have something invested in making sure that she's taught the right way. I asked if she were free on Friday. She impressed me by telling me that she was going to call in a favor and take the day off. This told me that she was All In. Good. We met at a local diner, and had bacon and eggs. Interestingly, she, I, and my dad all chose extra-crispy bacon as our breakfast meat, though we ordered separately. This seems portentous. We picked up some staples and a new staple gun, because rain falling meant no tape, and really, can you have too many staple guns? We went to Dad's club range, and after getting signed in, put up some paper plates at 7 yards. We discussed stance and hold, and then handed her my 6.5" Browning Buckmark. The first target was troubled. I watched her shoot, and we put in a second magazine, and I watched her very carefully. Finally, I felt that I had the problem: she had taken me exactly at my word. I had told her that I wanted her to grip the pistol tightly. She had such a tight grip on that steel Buckmark that her right forearm was visibly shaking. Okay, let's back way off on that grip. Now, let's grip it tightly, but not to the point of causing muscle fatigue. Instant success. The groups on the plates got smaller. We moved to the 4.5" Buckmark. They opened up slightly, due to the shorter sight radius and different grips. We went to a Glock 19. We used a 4" .22 kit gun. We shot a Colt Officer's Model Special 6". We shot a S&W M19 4", which she really liked. Then, to show the effect of lighter weight and shorter sight radius, we shot the 2" M13. Against my better judgment, I handed her my Kimber 1911 .45. I say "against my better judgement," because there was little point to it. This was the first day that she had ever picked up a handgun. Stupid YouTube videos abound of beginners being handed full-power firearms without adequate preparation, pointed downrange, and told to shoot, while the photographer giggles at the inevitable cringe of discomfort that comes form the shooter. This seems to be most commonly perpetrated by boyfriends to their girlfriends, and I speculate that the goal is to prove to the girlfriend what a big strong man the boyfriend is. ON THE OTHER HAND, there is a benefit that I saw to having her shoot the 1911. She was doing very, very well at this point, and had been for two and a half hours. She had proven that she understood sight picture and trigger squeeze. If, on her first time out, she shot the .45 and performed well, then she could honestly tell herself, "I can handle it" thereafter. I had marked plates with letters and pointed to the "B" target, and said, "It's going to move around and make some noise, but it won't hurt. Put the bullet into the 'B' where the two humps meet." And we have a winner. We fired a few more rounds, and I declared the training session over. There's a point where training fatigue sets in, and things can go downhill. So rather than get there, I asked if she would come out again soon, and we began to clean up. On the way back, I asked her what her favorite gun to shoot was. She described her favorite as being the 4" M19 with .38 special loads and Hogue grips. We'll do this again, soon. My youngest daughter all of 14 informed me that she wants both of my 4" Taurus Model 82's when I die. She said they're the easiest and most fun to shoot and accurate as well. Plus she knows how to reload the ammo with my Lee Loader. Sounds like she had a high class introduction. Awesome. Looks like she caught a serious case of "new shooter grin". Very nice smile. Who wouldn't want to see that? And, hell of a shot. Amazing what little ego and few preconceptions can do. This may get a bit sketchy.